In lieu of this week's Fresh Find, I wanted to share a cookbook that I recently picked up. 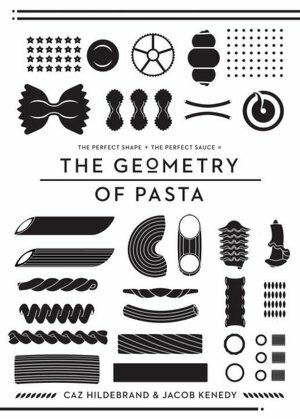 The Geometry of Pasta is a creative collaboration between Caz Hildebrand (creative partner at Here Design) and Chef Jacob Kennedy (of Bocco Di Lupo fame in London): Ms. Hildebrand designed and created the cookbook with recipes by Chef Kennedy. This cookbook is monochromatic, sprawled with super technical drawings (by Lisa Vandy of Now Ware), most of which are life-sized drawings of said pastas. Each pasta is a "chapter" which a brief history/story (if applicable) behind its shape/culinary use/etc. along with classic recipes recommended by Chef Kennedy. Beyond what we typically know as "pasta" (i.e., spaghetti, linguine, capellini, rigatoni, ziti, penne, macaroni, etc. ), there are tons of lesser known pastas (read: strozzapreti, gemelli, and tajarin as ones I've read about recently after dining out) that are explore in more depth than you can imagine. As you probably gather from my posts here on Four Tines, I love me lots of history and stories behind any given element in the dining/cooking experience. Overall, the book is incredibly well done -- it unifies the technical with the creative, the concrete with the abstract, and the pragmatic with the aesthetic. It makes for great bedtime reading -- learning about a pasta a week will have you reciting witty tidbits at your next fancy, schmancy Italian dinner outing. Price point: originally $24.95, $16.47 here on Amazon.com.